During the concert everybody in the Auditorium was asked to fill a questionnaire such that each piece could be evaluated. The goal of the questionnaire is to assess the perception of each music piece for the different listeners (cochlear implant users, normal hearing listeners, hearing aid users, etc). The results of the questionnaire for the three groups are presented in the Figure below. In total 250 people registered for the concert, 140 filled the questionnaire from which 51 were cochlear implant users and 7 were hearing aid users. Please note that the musIC 2.0 concert covered a wide range of styles. Each music piece used different instruments and technologies which impacted the ratings in different ways. The goal of the questionnaire is not to assess the best rated pieces but to compare the different listening groups. 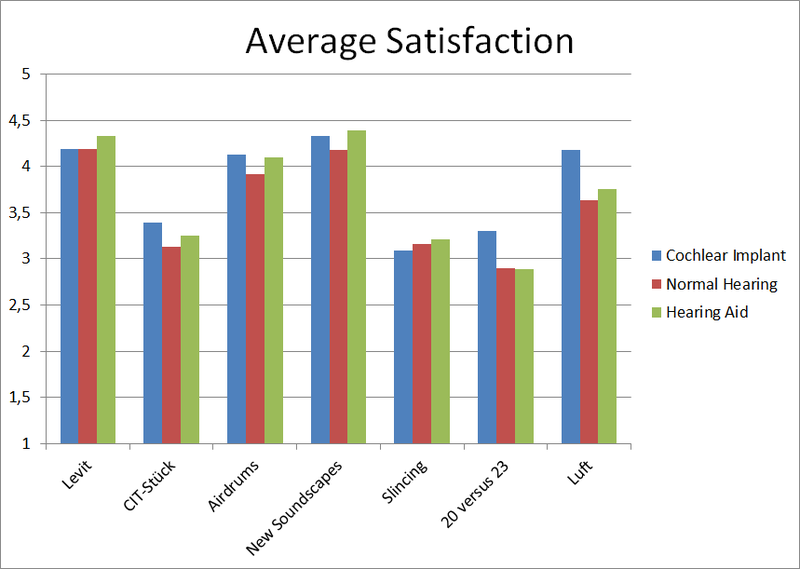 In general the three different groups obtained similar satisfaction ratios for the different pieces. 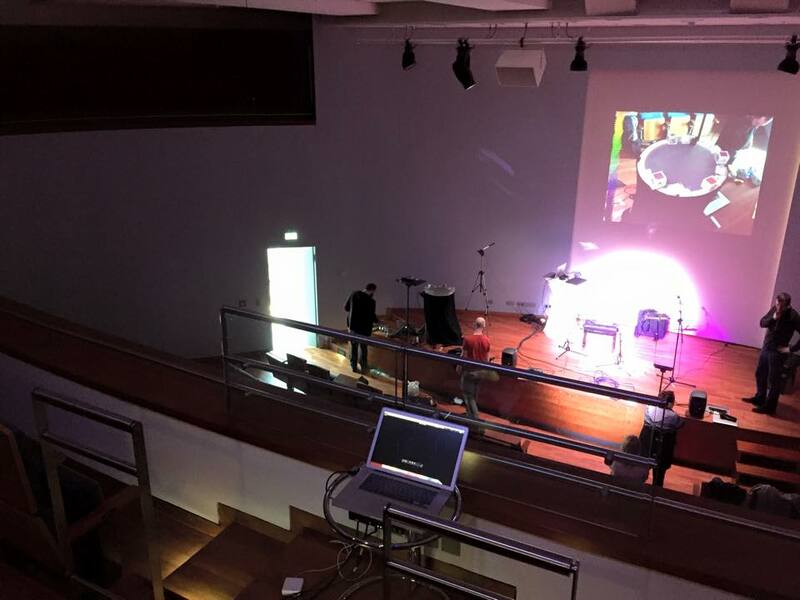 Ein Konzert speziell für CI-Träger – genau das bereitet gerade das Deutsche HörZentrum (DHZ) der HNO-Klinik an der Medizinischen Hochschule Hannover gemeinsam mit der Musikhochschule Hannover vor. 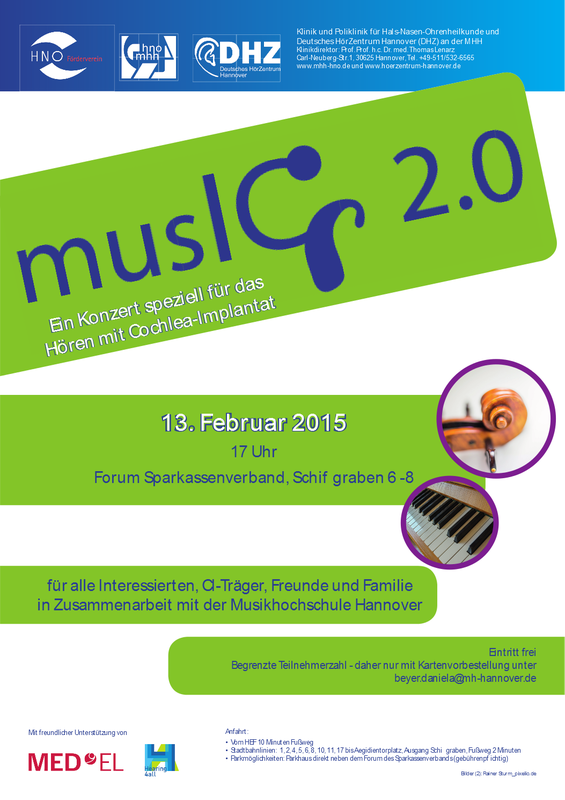 „musIC 2.0“ titelt das Konzert, zu dem CI-Träger mit Familie und Freunden sowie Interessierte und Musikbegeisterte für Freitag, 13. Februar 2015, um 17 Uhr im Forum des Sparkassenverbands am Schiffgraben 6-8 eingeladen sind. Konzipiert wurde das Projekt von Professor Waldo Nogueira von der HNO-Klinik der MHH. Da Musikhören für viele Träger von Cochlea-Implantaten eher schwierig ist – das CI war bisher in erster Linie auf ein gutes Sprachverstehen ausgerichtet – muss sich vielleicht die Musik ändern, um für CI-Träger ein Genuss zu sein. Aus diesem Grund komponieren die Tonkünstler der Musikhochschule Hannover neue Stücke, die auf die Besonderheiten des Hörens mit CI abgestimmt sind. Dazu hat Prof. Nogueira viele CI-Träger gewinnen können, die sich in mehreren Treffen mit den Musikern ausgetauscht und ihnen die Möglichkeiten wie die Grenzen des CI erklärt haben. Der Eintritt ist frei, allerdings gibt es aufgrund der begrenzten Platzzahl die Konzertkarten nur per Vorbestellung. Bitte melden Sie sich dazu bei Daniela Beyer von der HNO-Klinik, beyer.daniela@mh-hannover.de, Telefon 0511 532 3016. Mit öffentlichen Verkehrsmitteln ist das Forum über Haltestelle Aegidientorplatz zu erreichen, Parkplätze stehen im Parkhaus neben dem Forum (kostenpflichtig) zur Verfügung. 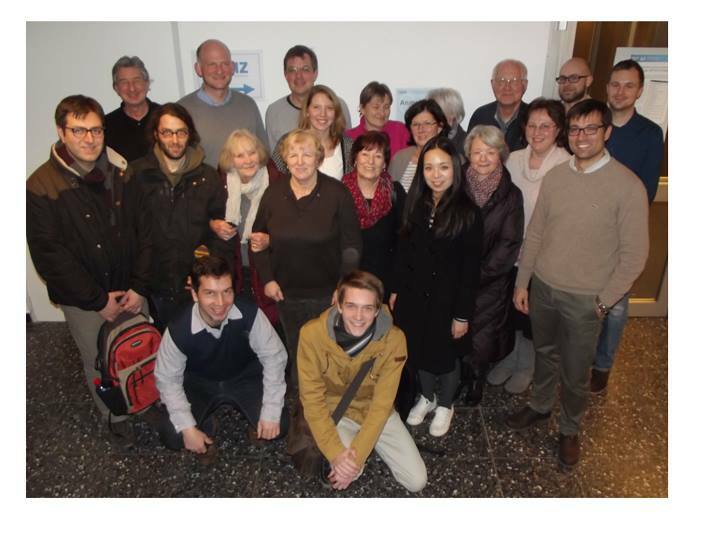 12 CI users and 4 composers met again at the German Hearing Center. This was the last possibility to interact before the final concert, the 13th of February! The Seminar was very fruitful, the composers came already with parts of their compositions and some of them even tried last minute changes. We all could feel that the compositions were maturing and we all are excited about the final concert. The seminar was organized dividing the 12 CI users in 4 groups. Each group started in a different room and after 20 minutes we changed the rooms. In each room each composer presented his/her composition or a part of it to gain feedback from the CI users. We organized a special Seminar in Barcelona. 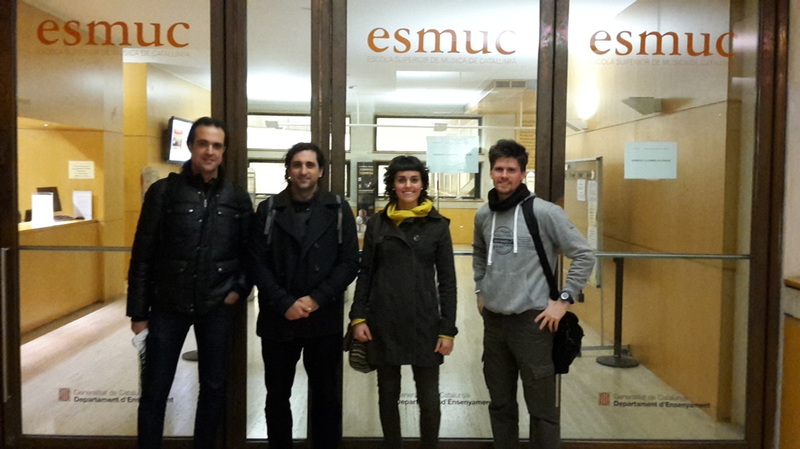 Two of the composers that will participate in the concert in Hannover and a CI user met at the ESMUC (Escola Superior de Musica de Catalunya). 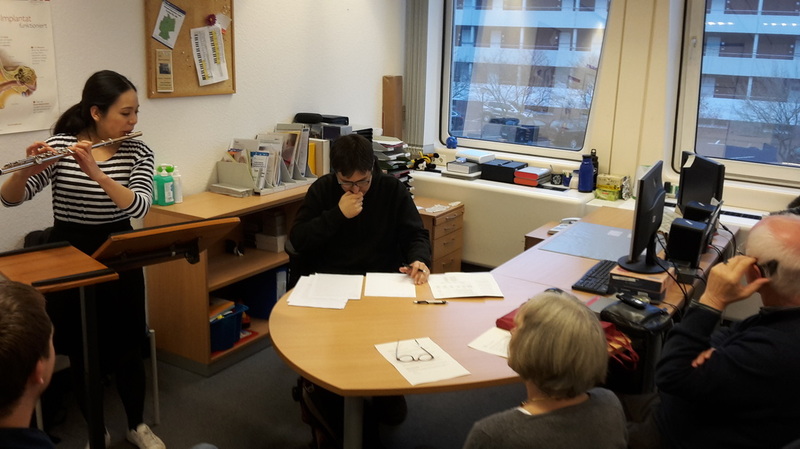 During this meeting the composers in Barcelona presented a preliminary recording of their compositions to the CI user. Additionally we talked about the limitations of listening to music with CIs and and the CI user could give us feedback. It was a very helpful meeting! Each group filled a questionnaire and underwent four activities sequentially. The results of the questionnaire are summarized in Table 1. Each activity was programmed by each composer. Jiuen Jun prepared some exercises with her violin, Arsalaan prepared some auditions using his recorded textures. 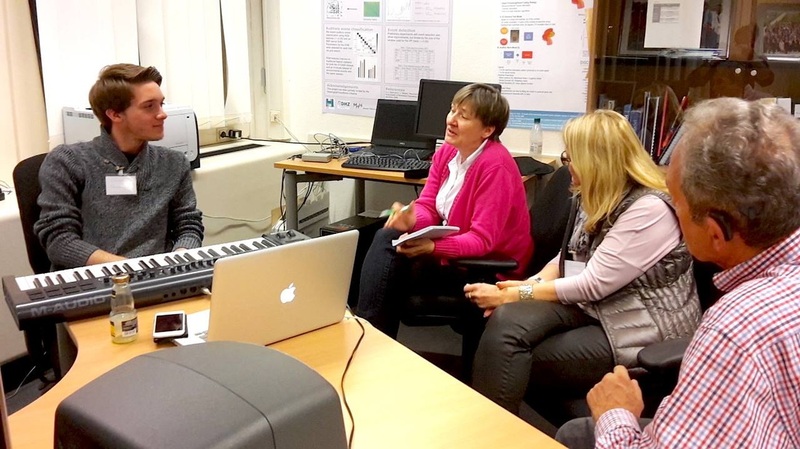 Jacob Sello presented his new great sesor interface and Clemens Damerau configured his keyboard to generate many different instruments. Each group of CI users actively interacted with the muscians. It was simply great! Seminar II was a great event. We started with a bit of delay, but we were able to cover all the topics programmed in advance. Seminar II was divided into three parts. Part I presented the technical details of cochlear implants. Part II was a great part, we connected to JP who wears a CI and hears perfectly on the other side, and she is a musician! The third part was also very interesting, we performed an audition of pieces from previous concerts (Barcelona, Melbourne and Southampton). I will start summarizing the first part. To start we reviewed some technical details about cochlear implants. We presented the frequencies assigned to the electrodes, the effects in dynamic and the effects of complexity to recognize timbre. Regarding the frequencies transmitted to the CI we put emphasis on low frequencies. MED-EL devices transmit very low frequencies, whereas Cochlear and specially AB start from higher frequencies. The highest frequencies transmitted by CIs are similar and lay around 8 kHz. Regarding Dynamic we put special emphasis on the low dynamic range of CI systems (typically around 10 dB). We also talked about compression/limiting, which typically occurs at around 65 dB SPL with any CI manufacturer. For example we discussed how to express emotions through dynamic in a CI and its potential limitations. Next we talk about timbre and the complexity of sound. With CIs we are trying to transmit sounds with few electrodes (12 to 22). However music requires complexity in the spectrum to code various instruments. We compared the spectrograms of single instruments with the spectrograms of complex music to show the differences in complexity. Finally we finished this part of the Seminar talking about the different implants available. We presented monolateral, bilateral, electroacoustic, bimodal and single sided deafness electrode implant configurations. We put emphasis on explaining that residual hearing might help a lot to transmit low frequencies. In the Second Part JP gave us a nice overview on the effect of variability in CI music listening performance. The main take home message here is that CI users show huge variability in their musical skills and that this variability is dependent on their performance. If in a given task they perform worse, this task shows greater variability. JP also put emphasis on the different devices, explaining the benefits of having residual hearing and using bilateral CIs. This part finalized having some discussions and questions regarding the own experience when listening to music by JP with her CI. For example she was very clear saying that a VoCoder is not representing the sound produced by a CI, so the VoCoder presented on the first part has to be used with a lot of care. My impression is that JP has very positive experience using his/her CI to listen to music. However, it was explained that the sound produced by the CI is of course not as good as the sound received from the natural ear. On the third part we had an audition of music from previous concerts. We started from the electroacoustic concert in Melbourne. There were some surprises from the CI audience, as the music was received as being abstract. Instruments were difficult to recognize. Next we listen to a piece composed for the concert in Southampton. This piece was received very well, with marked rhythms and nature sounds. 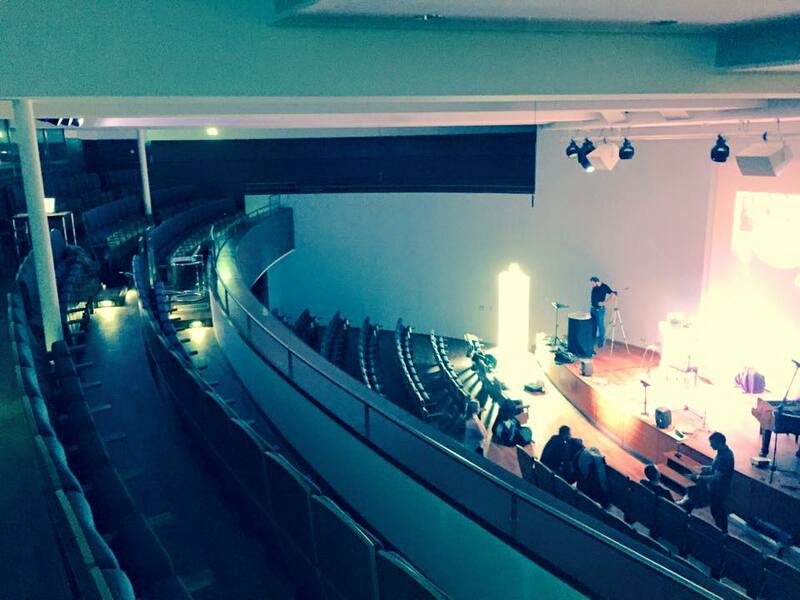 Finally we listen to Levit1 and to Almost new Spaces from the musIC 1.0 concert in Barcelona. Both pieces were very well received. Levit1 was received as producing a calm sensation, and Almost new Spaces as having a clear rhythm and melody which could be follow acoustically and in some cases through the visualization.